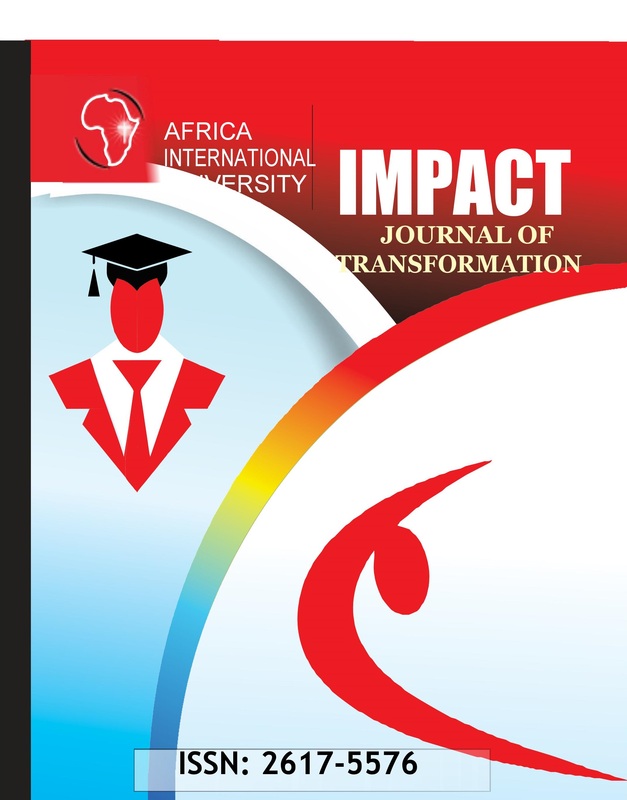 Impact: Journal of Transformation is a multidisciplinary international, peer reviewed journal published in English by the Institute for the Study of African Realities (ISAR), Africa International University, Nairobi, Kenya. It is a scholarly journal of research and opinions in the theological, Business, Humanities and Social Sciences. Impact was first published in 2016. Africa International University is dedicated to high academic standards based on research, in-depth readership and innovative community engagements. The journal will therefore help in analyzing the African conditions in a more holistic manner. The journal will be receiving continuously well-written complete papers that conform to its guidelines for possible publication in the volumes published in February and September. The focus of the papers should be original and appeal to academicians, researchers, policymakers, administrators, and general readers. Papers for publication in the February issue should be submitted before end of January and the ones for September before end of August. The production of this journal is being coordinated by CRP under the auspices of ISAR. The journal is meant to contribute to the overall objective of equipping Christ centred leaders for the transformation of God's people and world through innovative awareness creation programmes, research and community engagement. The articles contained in the journal were carefully chosen. They are meant to provide insight to the role of the university in transforming the society. The articles have been contributed by the members of the university and external writers who share the same vision with the university. Africa International University Impact: Journal for transformation.